The above video was taken by former North Carolina All-American Steven Cebertowicz. Follow Steven on Twitter at @Cebertowicz. There are many records for which USA Swimming, the official body of record for swimming in this country, doesn’t keep official records. Still, someone is still the fastest ever in these races, and now Stanford volunteer assistant Eugene Godsoe is the fastest American ever in the 50 yard backstroke. 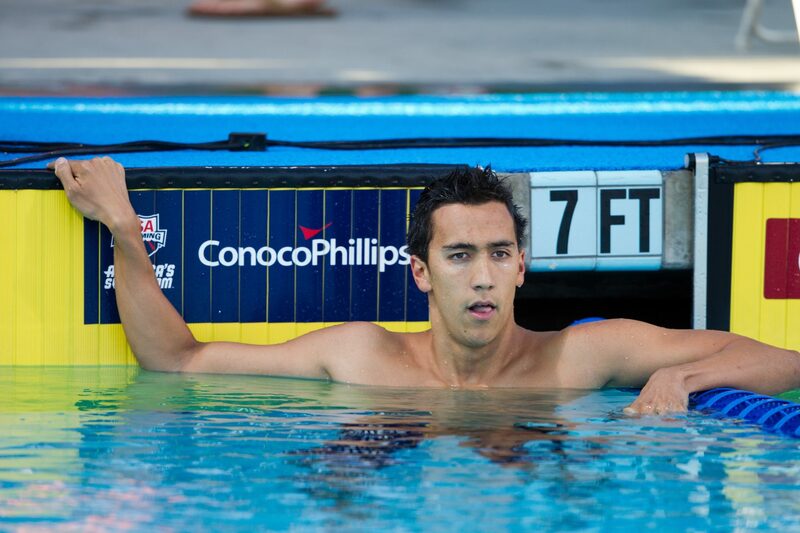 On the final night of the 2012 Pro-Am meet in Oklahoma City, Godsoe swam a 20.78 that breaks an unofficial American Record in the event. The previous fastest Americans in this race was Ryan Lochte from the 2005 SEC Championships in 20.92 and Auburn swimmer Jared White, who split a 20.88 at the 2009 NCAA Championships in prelims. The only man who has swum a faster 50 backstroke is Venezuelan Albert Subirats, who went a 20.73 at the 2008 NCAA Championships while representing Arizona. Out of all of the 50 yard events, this is the most commonly raced at a senior level, given that relay leadoffs for the 200 yard medley relay count as an individual 50 yard swim. Godsoe swam a 44.75 in the 100 backstroke on Saturday that almost broke Matt Grevers’ official American Record of 44.55. For what it’s worth, Subirats’ best is likely to go down in the coming years, as Bolles swimmer Ryan Murphy has been a 21.09 at only 17-years old. The event got off to an inauspicious start when not a single swimmer showed up for the C-Final of this 50 backstroke: quite peculiar indeed. Subirats was 20.66 in prelims in 2007 and I believe faster in finals, though the relay was disqualified, and no split results posted. Olsswim – I’ll see if I can track down some confirmation of that (though not sure I’ll have much luck). why didn’t anyone show up for C final? I thought this was an elite level meet?